When the apartment above their original duplex became available, the owners seized the opportunity to enlarge for their expanded family. Nestled into a developer’s disparate and hidden rooftop addition, this space was crowded by an imposing, non-functional mezzanine and contorted stair. 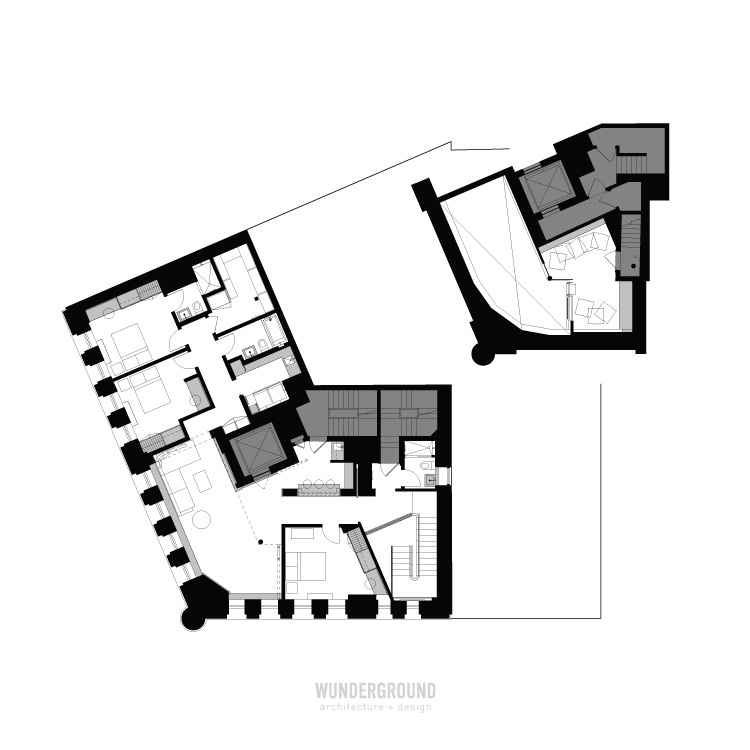 The structure was reconfigured and spaces were redistributed to include 3 bedrooms, 3 bathrooms, a family TV room, play area, separate craft room, and central family laundry. By relocating the floor area from an access walkway and eliminating the stair in favor of a custom ladder, we opened up the 18’ tall sky lit space and enlarged the useable loft area. Marrying the aesthetic we’d established at the lower level with blackened steel components and colorful details made this floor a playful complement to the main level. The inclusion of casual and support spaces allows this apartment to accommodate a family in refined style.